VIPs, celebrities and the biggest names in music will be in town for the biggest weekend in the events calendar. FLASH have laid on some of the biggest names in music with an impressive line-up for the young and old alike. The du Arena will play host to the ‘after race parties’ with U.S rapper Pitbull (Thursday), electronic duo Chemical Brothers (Friday), living legend Lionel Richie (Saturday) and global superstar Rihanna closes the Sunday night. If those concerts aren’t your thing, or you’re looking to carry on the party into the small hours, then there are a wealth of VIP parties taking place, with the chance of rubbing shoulders with the rich and famous. On Thursday, November 24, MAD on Yas Island will kick start the 2016 Formula 1 Etihad Airways Abu Dhabi Grand Prix Yasalam Entertainment with a line-up of celebrity appearances. The weekend’s events will include special guests and live performances by T-Pain on Thursday, November 24; Sean Paul and Rita Ora on Friday, November 25; Akon & Travis Scott on Saturday, November 26 and Future on Sunday, November 27. Mobilee Records, a leading name in Berlin’s electronic music industry, comes to Abu Dhabi on November 24 – the Grand Prix Thursday – with an exciting line-up of international DJs. The F1 Mobilee Rooftop World Tour 2016 is brought to the capital for the first time under the ‘Gorgeous Presents’ brand, known for its spectacular New Year’s Eve parties on Sydney Harbour in Australia. Held at the Skylite Rooftop Lounge at Yas Viceroy, this is the second-last leg of the Mobilee Rooftop World Tour this year having toured some of the most exclusive venues in Copenhagen, Beirut, Los Angeles and Johannesburg before it returns to Sydney on December 31. Entrance: starting AED 249, tickets here. Award-winning DJ Steve Lawler will kick-start the weekend on Thursday, November 24. Electronic music duo, HVOB, are set to perform on Friday, November 25 after a Sunset Session by Turkish DJ and producer, Mahmut Orhan. The WHITE Dubai Experience will return to Yas Island on Saturday, November 26, while Nic Fanciulli will close the weekend’s events on Sunday, November 27. Entrance: This event is exclusive to #AbuDhabiGP ticket holders. You can purchase your F1 tickets at www.yasmarinacircuit.com. Beats on the Beach is back, and you need to be there! Get down to the free international music festival, which will which has historically showcased an amazing line-up of talent from Jason Derulo and Fatboy Slim to J. Cole and Assi El Hellani. Gracing the stage this year are International superstar Sean Paul, Arabian songstress Nancy Ajram, Filipino mega-star Yeng Constantino, former X-Factor Arabia finalist Adham Nabulsi, charismatic hip-hop star Travis Scott and fast-rising British urban duo Krept and Konan, plus one final act to be announced soon. After last year's explosive F1 Race weekend party with SOLOMUN. This year they are taking it up to a whole other level! Bigger space, bigger party, bigger everything! VIP Room, the famous club brand, prepares to host its exclusive pop-up nightclub for the 4th year running at the 2016 Formula 1® Race from 25th to the 27th November. 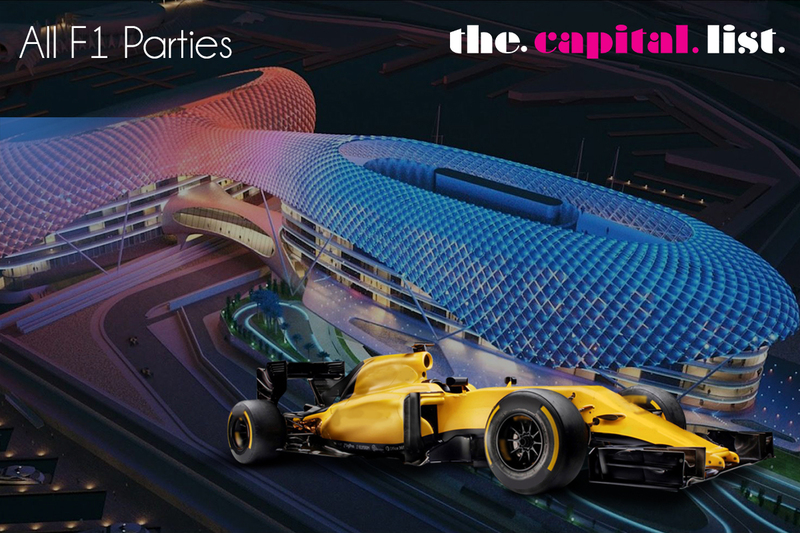 The pop-up venture will feature on the 3rd floor of Yas Marina Building 1, in association with international luxury and all-new restaurant concept Cipriani Yas Island, overlooking the fabulous Abu Dhabi Grand Prix Circuit. Over the course of 3 days, this year’s celebrity bash will take the city by storm with RnB legend Drake, live DJ sets by Cadenza Records techno icon Luciano (Official Page) and American socialite, DJ and TV personality Paris Hilton. Celebrate the last race on the F1 calendar with exhilarating post-race parties with Live Performances & the Amber Lounge Celebrity Yacht with F1 Driver appearances! Having hosted sell-out parties across the year, Amber Lounge, The Original F1 Experience, is proud to announce British R&B superstar Jay Sean as the first headlining live act of Amber Lounge Abu Dhabi 2016 on Saturday 26th and Sunday 27th of November at the fabulous Yas Links Golf Club. Saturday, November 26 & Sunday, November 27: Jay Sean, live Performances & the Amber Lounge Celebrity Yacht with F1 Driver appearances. Fuel your excitement at Abu Dhabi’s most stylish rooftop lounge during Race Weekend. Enjoy upbeat house music as you sip on signature cocktails accompanied by delectable tapas under the sparkling light-filled canopy of Yas Viceroy Abu Dhabi. Each year Tonique Beverage Consultancy brings a new and innovative pop up lounge concept to the race weekend. This year the open air terrace at the center of Yas Marina’s promenade will be transformed into the Terrazza Martini. Expect 3 days of non-stop entertainment at the Terrazza, mixing racing with music and Martini cocktails. Sophisticated DJ soundtracks and musical styles will flow throughout the Terraza creating three vibrant scenes for guests to enjoy (day/night/afterparty)”.